For some years now I have been both an occasional participant and ongoing witness to the practice of Lean management in State governments. 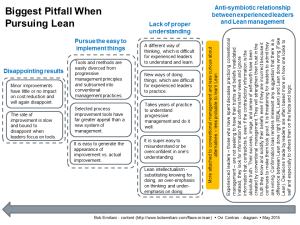 I continue to see methodological errors in relation to how Lean is practiced in industry. Those in industry who practice Lean management correctly provide us with a standard by which we can compare the practice of Lean in government. This comparison is fair because Lean management, fundamentally, is a system for processing information. All organizations process information, whether for profit, not-for-profit, government, NGO, etc. 1. Program or Initiative: Lean is seen as a “program” or “initiative.” It’s not a program or initiative. It is the replacement of State government’s (or an agency’s) batch-and-queue information processing system with a flow (Lean) information processing system. Lean is a new management system, replacing the old, in which improvement has no end, not a program or initiative which has an endpoint. 2. Employees’ Concerns. Employees today have the same six criticisms of Lean as they had at the dawn of progressive management 100 years ago. Management’s focus on the rapid implementation of Lean tools ignores their important and real concerns, and thus fails to respect people from the outset. Leaders must address employees’ concerns from the start. Unfortunately, most leaders don’t know how to explain they are not trying to turn people into robots or speed them up and burn them out. They must learn how to do this if they hope to obtain employee buy-in for Lean management in government. 3. Steering Committees: State governments often create steering committees comprising members of the various State agencies. This is nothing more than a finance or budget office oversight activity due to lack of trust and is not necessary. Never apply traditional project management concepts and methods to process improvement activities because it slows down improvement. Replace steering committees with a Kaizen promotion office and cross-functional and cross-agency kaizen teams. 5. 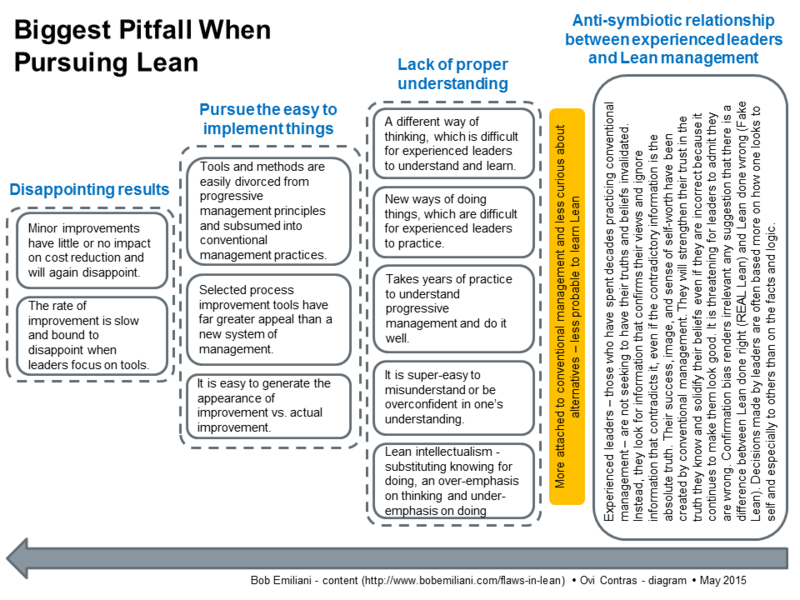 Map Every Process: “Lean” is understood to be nothing more than process mapping. This is incorrect. Process improvement teams are required to map the process before efforts to eliminate waste, unevenness, and unreasonableness can begin. This is not necessary and causes delays. In one State government Lean “initiative,” future state maps are said to describe the process “after several months of improvement.” Replace “several months” with “several days.” Instead of mapping processes prior to kaizen, proceed directly to kaizen. If mapping is necessary, then do it quickly during the kaizen. Focus on flow. 6. Kaizen Events: Also referred to as “process improvement reviews.” Kaizen is neither an “event,” which has a start and end, or a process “review,” which suggests that management buy-in is required before any improvements can be implemented. Kaizen is understood and practiced as a meeting to “formulate plans” or as a “brainstorming session” to identify improvement options resulting in a “project implementation plan” and the assignment of “responsibilities and milestones.” None of these are correct, and these flawed understandings of kaizen build in long delays. Never apply traditional project management concepts and methods to kaizen. Kaizen has no end and must occur every day, and everyone must participate in kaizen – Governor, agency heads, and everyone else. Say “kaizen” instead of “kaizen event.” Click here and here to learn about kaizen. 7. 5S Events: Breaking kaizen up into smaller bits, such as 5S events or value stream mapping events, is incorrect and a carryover from conventional management practice. Don’t atomize kaizen. Kaizen, done correctly, results in more than a dozen improvements in different aspects of a work process, to get information to flow, not one single aspect such as 5S. 8. Standard Work: Standard work is seen simply as a procedure for doing a job. Actually, standard work is comprised of a standard work sheet and standard work combination sheet. The latter breaks the process down into small intervals, with the aid of a stopwatch to expose waste. The standard work sheet alone will not do this. Standard work combination sheets must be created as well. Standard work is one of the basics of kaizen that must be mastered. 9. Suggestion System: Suggestion systems, QC Circles, etc., are important continuous improvement methods, but the huge gains in productivity can only be achieved through traditional industrial engineering-based kaizen. There is no Lean without kaizen. 10. Recommendations: The result of “projects” and “events” are recommendations to management about what improvements the team would like to make. This is a carryover from conventional management practice. Kaizen teams do not study an abnormal condition and then make recommendations to management, which introduces a delay. Instead, they quickly study an abnormal condition and then immediately make improvements. Management, from the start, empowers kaizen teams to eliminate waste, unevenness, and unreasonableness without needing to seek permission to do so. Never apply traditional project management concepts and methods to kaizen. 11. Reporting to the State Finance or Budget Office: The head of the State Lean Office reports to the state finance or budget chief. This is incorrect. It is a common error because Lean is understood narrowly by State leaders as cost savings. Instead, the head of the State Lean Office should report to the most senior person responsible for the value creating activity of the organization. In State government, that would be the Governor or Lieutenant Governor. 12. Savings to Justify My Position: The head of the State Lean Office says: “I have to find savings to justify my position.” While cost reduction is indeed important, the head of the State Lean Office is also responsible for improving the value proposition for taxpayers and customers, guiding agency staff on how to improve information flow, organizational learning, and so on. 13. Change Management: State leaders think they must invoke complicated change management protocols rooted in organizational behavior and organizational development. This is a carryover from conventional management practice. Ignore change management. Kaizen, itself, is the change management practice. Change management programs on top of kaizen simply add cost and create delays. Instead, do kaizen; lots of kaizen. 14. Lean in Government Services: States engaged with Lean limit its practice to services rendered to taxpayers and customers. They should also apply Lean principle and practices to legislative processes, to reduce lead-time from problem identification to (legislative or non-legislative) solution. Legislators need to understand that Lean government applies to them as well. Failure to do so will result in a delay that will require re-work at some point in the future. 15. Time Required to Make Improvements: The results State governments get and the speed that they get them depend upon leaders’ understanding of Lean management and the processes they use to improve. In every case that I know of, State leaders’ understanding of Lean management is poor, and the processed used are poor or incomplete. The result is very slow process improvement. Improvements made in State government that occur over the course of 2 or 3 years are done within a few weeks in industry. Nothing can justify such a great difference. Lean in State government will achieve greater impact, faster, if these methodological errors are corrected.